Four international firms have made it in the preliminary technical evaluation of a tender opened by the Ethiopian Petroleum Supply Enterprise (EPSE) to procure 700,000 tonnes of coal for 23 factories. The procurement will cost the Enterprise an estimated 56 million Br. The bid was opened last week on July 10, 2017, in the presence of bidders and five committee members from the Enterprise, who were assigned to oversee the tender process, at the premises of EPSE. The factories will pay in full the total finance of the bid. Glencore Plc, HC Trading, Riftcot Limited and Huyton Inc are the companies that fulfilled the requirements to compete in the technical evaluation of the bid to supply the coal. About 600,000 tonnes of the coal will be imported based on the request of 20 cement factories in the country except for Derba Cement, which imports without the involvement of the Enterprise. The remaining 100,000 tonnes will be procured for East Steel, C & E Steel and DI Ceramics. Among nine interested companies competing in the bid, five were local and were rejected for failing to fulfil the requirements of the Enterprise, according to Abayneh Awo, manager of petroleum supply & sales department at the Enterprise. "The bulk procurement is made to save foreign exchange based on the collective requests of the companies," said Abayneh. A similar bid for the purchase of coal was won by Riftcot last year. The company was awarded to supply the 700,000 tonnes of coal to different factories in the country. Headquartered in Kenya, Riftcot specialises in the supply of coal, Bitume Electricity Generation and Off Grid Lighting items. The company claims to have the largest share of coal and clinker in East Africa. The Enterprise will award the bid in the next two weeks after opening the financial evaluation in the coming week at the premises of the Enterprise. The awarded company will supply the coal for the cement factories monthly whereas the remaining factories will get the cement on a quarterly basis. Founded in 2012, the Enterprise's main mandate is procuring petroleum products, but since 2013, upon the request of cement and other factories, it started to import coal on their behalf. 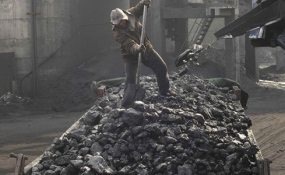 Ethiopia imports over 750,000 tonnes of coal annually, of which more than three-fourths is for cement businesses, which heavily depend on carbon intensive fuels such as coal. In the case of Ethiopia, more than 50pc of the energy consumption of cement factories is fulfilled by coal. Although the country has a potential of extracting 197.6 metric tonnes of coal annually, almost all cement firms in Ethiopia chiefly import coal as their major source of energy. "Instead of using oil, it is beneficial for cement factories to use coal as a source of energy," said Abebe Dinku (prof), a civil engineer with three decades of experience in the construction industry. "It is also cheaper than other means of energy."